Free housing is available for out-of-town patients at the Fellowship Center. 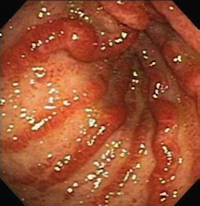 GAVE (Gastric Antral Vascular Ectasia), also known as “Watermelon Stomach”, is a condition in which the blood vessels in the lining of the stomach become fragile and become prone to rupture and bleeding. The stomach lining exhibits the characteristic stripes of a watermelon when viewed by endoscopy. Symptoms of watermelon stomach may include chronic anemia, acute gastrointestinal bleeding, vomiting of blood and dark, tarry stools. The exact cause of watermelon stomach is not known. Watermelon stomach is often associated with a number of conditions, including portal hypertension, chronic renal failure, collagen vascular diseases and systemic sclerosis. The chronic blood loss in watermelon stomach patients causes iron-deficiency anemia, requiring iron supplements and blood transfusions. Iron supplements and blood transfusions are commonly used to control watermelon stomach symptoms. Lasers and argon plasma coagulation may also be used for management of bleed in the stomach lining. The Center of Excellence uses the HALO 90 ablation technique, a new endoscopic outpatient procedure for treatment of patients with watermelon stomach. The HALO 90 catheter allows treatment of a large area of affected tissue rapidly with well controlled depth of ablation. Each application of HALO 90 catheter provides a uniform treatment to a rectangular area of 20 mm X 13 mm, much larger than argon plasma coagulator can achieve. The entire diseased tissue may be treated in one session using repeated applications of HALO 90 ablation. HALO 90 ablation may be used in patients who have failed other modalities.